Logo Design Website Design Brochures Design Packaging Design Illustrations 2D Animation Flyers Design Posters Design 3D Product Modelling Stationery Design Advertising Design Please select an item. In this vector background tutorial, we will be learning on how to make this marine tiles effect with the transform tool. You will need a harmonic colour scheme to match your pattern. Copy and paste suitable colour palette it to your document. Next, draw a rounded square by holding shift to constrain the proportion. Use the colour picker to pick the turquoise colour from the colour palette. 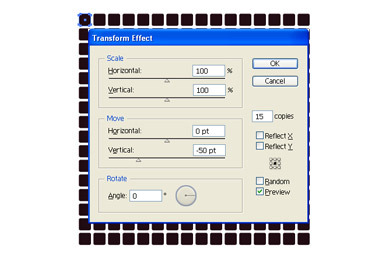 Navigate to Effect>Distort & Transform>Transform. Choose 15 copies and increase horizontal to 55 pt to leave gaps in between the tiles. Click OK. This will create a row of horizontal tile. Navigate to Effect>Distort & Transform>Transform again. Choose 15 copies and increase vertical to -55pt to tile it vertically. 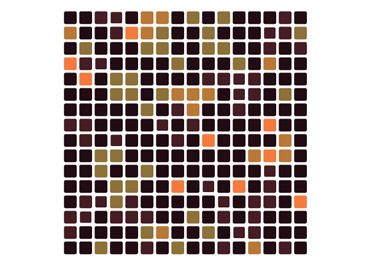 Expand the transformation to recolour the tiles. 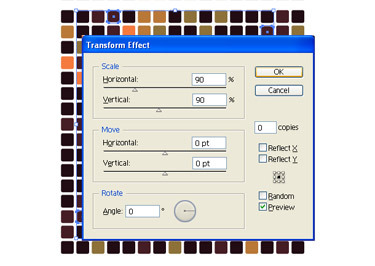 Navigate to Object>Expand Appearance to expand the pattern. Click Ctrl/command+G 2 times to ungroup the tiles. Choose some random tiles and use the colour picker to picker a lighter tone. Repeat the steps above to set different random tones to your pattern. Resize the tiles randomly. Navigate to Object>Transform>Transform Each. Set both horizontal and vertical scale to 90%. Choose some random tiles you want to transform and press Ctrl/Command+D to repeat the previous transformation again to the tiles. This will resize it 90% smaller. Press Ctrl/Command+D a few more times to make the tiles smaller. Here is the final tiles pattern.